The evolutionary relationships of most notoungulates are not entirely clear. This is particularly true for notoungulates that diverged prior to the split between typotheres and toxodonts (basal notoungulates) and early members of the Typotheria (basal typotheres). Basal typotheres are generally placed in the families Oldfieldthomasiidae and Archaeopithecidae, but although some phylogenetic analysis have found these to be members of the Typotheria (e.g., Cifelli 1993; Billet 2011), others have not (Vera 2016). Left: Reconstruction of the skull of Oldfieldthomasia debilitata in lateral view. Right: Left upper P1-M3 (above) and left lower p4-m3 (below) of Oldfieldthomasia debilitata in occlusal view with anterior to left. Both figures are from Simpson (1967). The geologically oldest typotheres come from the early Eocene of Itaboraí, Brazil and are placed in the family Oldfieldthomasiidae. The species from this site, Colbertia magellanica, is one of the more abundant mammals in the fauna and is known from limb bones in addition to teeth and jaws (Bergqvist and Bastos 2009). It was a medium-sized animal that was probably 1-2′ long (30-50 cm), similar to a Virginia opossum. A closely-related species from northwest Argentina, Colbertia lumbrerense, is known from a mostly complete skull that has provided detailed information about the anatomy of the skull base of these notoungulates (García López 2011). Lorente et al. (2014) described limb bones of an oldfieldthomasiid from western Argentina, Allalmeia atalaensis, and estimated its body mass at about 6.5 lbs. (3 kg). The family name Oldfieldthomasiidae is based on the genus Oldfieldthomasia, which has been found in middle Eocene (Vacan and Barrancan) strata in Argentina. This unusual name was coined by Florentino Ameghino to honor the English zoologist Oldfield Thomas. Some well-preserved fossils of Oldfieldthomasia have been found, including a skull that Simpson (1936) sliced into 55 four-millimeter-thick pieces in order to describe the anatomy of its cranial cavity. Nowadays, such studies are done virtually using computed tomography (CT scanning). Oldfieldthomasiids are less specialized than later typotheres and characterized by a complete, closed dentition (i.e., they have 22 teeth in their upper and lower jaws with no spaces among them) in which the premolars and molars are low-crowned (brachydont). López and Bond (2003) suggested that some species currently referred to the family Oldfieldthomasiidae should be placed in a separate family. However, that family has not yet been formally named nor defined. 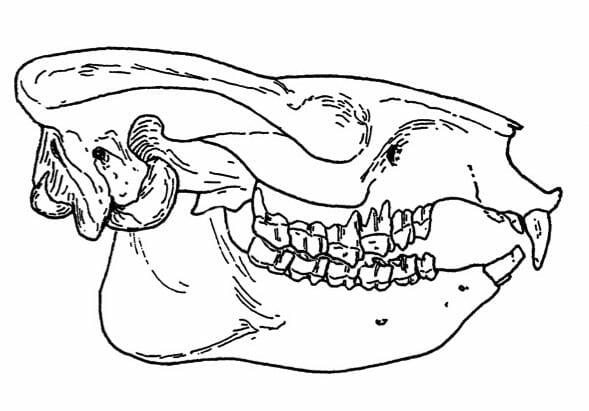 Upper (left) and lower (right) dentition of Acropithecus rigidus (from Simpson 1967). The specimen on the left is a left maxilla in occlusal (upper) and labial (lower) views. The specimen on the right is a left mandible in occlusal (above) and labial (below) views. The family Archaeopithecidae is only represented by two uncommon genera from the early and middle Eocene (Archaeopithecus and Acropithecus). They were relatively small animals, like many early typotheres, and are characterized by their more conical incisors and canines and certain aspects of their cranial anatomy. Their cheek teeth are almost identical to those of the early interathere Notopithecus. Florentino Ameghino thought that these and other small, early notoungulates were the ancestors of apes and monkeys. For that reason, he named them Archaeopithecus (“ancient ape”), Acropithecus (“topmost ape”), and Notopithecus (“southern ape”). Bergqvist, L. P., and A. C. F. Bastos. 2009. A postura locomotora de Colbertia magellanica (Mammalia, Notoungulata) de bacia de São José de Itaboraí (Paleoceno superior), Rio de Janeiro. Revista Brasileira de Paleontologia 12:83-89. Billet, G. 2011. Phylogeny of the Notoungulata (Mammalia) based on cranial and dental characters. Journal of Systematic Palaeontology 9:481-497. Cifelli, R. L. 1993. The phylogeny of the native South American ungulates; pp. 195-216 in F. S. Szalay, M. J. Novacek, and M. C. McKenna (eds. ), Mammal Phylogeny: Placentals. Springer-Verlag, New York. García López, D. A. 2011. Basicranial osteology of Colbertia lumbrerense Bond, 1981 (Mammalia: Notoungulata). Ameghiniana 49:3-12. Lorente, M., J. N. Gelfo, and G. M. López. 2014. Postcranial anatomy of the early notoungulate Allalmeia atalaensis from the Eocene of Argentina. Alcheringa 38:398-411. Simpson, G.G. 1936. Structure of a primitive notoungulate cranium. American Museum Novitates 824:1-31. Simpson, G. G. 1967. The beginning of the age of mammals in South America. Part II. Bulletin of the American Museum of Natural History 137:1-260. Vera, B. 2016. Phylogenetic revision of the South American notopithecines (Mammalia: Notoungulata). Journal of Systematic Palaeontology 14:461-480.